Home remodeling is a nerve-racking job. Everything starts from scratch in this process along with an additional burden of the demolition of what is not required. From tearing down the unnecessary wall partitions and the out-dated interiors or deconstructing the complete building – everything forms a part of the demolition process. Remodeling as the term suggests refers to altering the layout or structure of the building. So, to achieve that complete alteration, you would first need a demolition contractor. But hiring one isn’t as easy as it sounds. You have to choose someone who is knowledgeable and knows the work really well, which is no less than a challenge. Before you head out to hire a demolition contractor, you have to first ensure that all the work you want to get done is planned out carefully. Whether it is a straightforward demolition or remodeling a part of your house, you have to be clear with your vision. Is it stripping the interiors? Is it redesigning the whole space? Is it only about re-painting the walls? Are you planning to install new things? All these questions should strike your mind first before you even decide to hire someone. Always remember that no two remodeling projects are the same. The kind of remodeling you would go for will decide what kind of contractor will be best for you. Also, you should have access to all the essential information like what is the size of the house, what are the materials used in it, how thick is the foundation, will the demolishment affect the nearby surroundings, etc. Word of mouth is the best way to find a qualified demolition contractor in your city. Nothing can beat the prominence of this form of publicity as it solely rests on an individual’s personal experience with the contractor. So, start your search by asking reliable people around you who have had the similar work done. Speak to your friends, family, relatives for any recommendation they might have. Ask what their experience with the prospective contractor was and what made them give good feedback for him. There are greater chances of meeting the right demolition contractor quickly through your social circle. For the people who don’t wish to rely on recommendations given by their relatives, they should start searching for local demolition contractors operating in their locality. In the present scenario, there would be hardly any contractor or a company involved in the demolition process which is not listed online or doesn’t have an established online presence. Checking out the contractors’ website, the feedback and ratings given by their past clients is a great way to judge the quality level of their services. A contractor having plenty of negative reviews should be dropped off from your list immediately. Demolition of a building or a part of it comes with its own set of complications. There are unknown surprises behind the wall, dangerous electrical wiring systems that need to be handled with care. If you are planning a home remodeling, then you need to find a contractor that has specialization in residential demolition. So, call the local demolition contractors and ask about their expertise. The contractors carrying a similar level of specialty as required by you should stay on your list and the ones that don’t match your criteria should be ignored. Nothing is as worse than hiring a contractor who is not licensed by the state authorities. A license is a mandated requirement for every contractor to be able to work in the community and keep it updated as well to continue with business operations. The certifications indicate that the contractor belongs to a certain organization and abides by its strict rules and ethics and is hence more reliable than any other non-certified contractor in the city. So, never be afraid of asking the contractors for their license numbers and the types of certifications they hold. A contractor denying or hesitating to show you the license number is surely a red flag. Also, stay away from the contractors that don’t have insurance or else you will land up with huge liability in case any team member or a person walking by your home gets injured during the course of the project. As a homeowner, it is your job to have complete clarity as to what kind of job you want to get done. Also, it is a duty job to specify the same to the contractor in as much detailed manner as possible. Some renowned demolition contractors often ask their clients to send pictures of the site and then discuss what exactly needs to be done. If your shortlisted contractors don’t ask so, you can yourself ask them if you can send pictures or if they are comfortable in visiting your premises personally. When you are done narrowing down your options to 2-3 potential contractors, you should ask them to share the overall cost of the job along the time duration required to complete it. It is always recommended to get bids from multiple contractors to be able to select the most feasible one. But make sure, you don’t only hanker for the lowest bids and rather pay due respect for the experience and skill of the contractors as well. Demolition is followed by huge heaps of useless concrete and damaged building materials, so make sure your contractor helps you in disposing it of systematically. As a smart customer, always make sure you get all the discussed terms and conditions laid down in a written contract. Have a thorough reading of the documents prepared by your contractor and only after carefully scrutinizing, take it further. Don’t just rest assured on verbal commitments or you may regret it if any ambiguity arises in the future. Getting a driveway coated with asphalt can be an expensive service. What more? It is not every day that you get your driveway asphalt coated. So, you would want to take every precaution, whatsoever and employ adequately skilled paving contractors to do the job to the best of their ability. As necessary as it is to ensure that you hand over the job of aestheticizing your driveway to an experienced paving contractor only, it is equally important to also make sure that your new driveway gets as much care and maintenance as it gets attention. Did you too, got your driveway beautifully paved with asphalt? Well, great if you did! But, are you also providing it with the care it needs to retain its freshness? If you are absolutely clueless about what we are talking about, hang on! We’ve got your back with some professional tips about how to maintain your new asphalt driveway. A bunch of simple steps is all that will be needed for the maintenance of your new driveway. We’ll, that and some effort on your side. These simple steps will make sure that your brand new asphalt coated driveway stays protected and functional for many years to come. Find below, some reliable examples of the ways through which you can maintain your asphalt driveway. Also, do not worry, as you would not have to shed big bucks to hire a professional paving contractor for the regular maintenance of your asphalt driveway. With the following tips, you can take care of your driveway all by yourself! A large number of driveway repaving that is performed today is in the first place, needed because of a previously performed bad sealing job, or because the wrong materials having been applied to the surface of the driveway by the previous paving contractor. Do not use materials that are water or latex based as they tend to dry out the surface and cause cracks because of the presence of certain additives. You wouldn’t even know and your asphalt coated driveway would have become a mess within just the first three to five years. Also, you wouldn’t want to repave your driveway again that quickly, or would you? It might be tempting for you to get over enthusiastic and head straight away to your local home improvement store to get some cheap repaving materials to quickly glam up your driveway again. In general though, doing that will only prove harmful for your driveway. Those materials are usually of inferior quality and will result in a low-quality job only. Sealcoating is not the only step when it comes to looking after your driveway. There are also some other steps that you can take to maintain the surface of your newly coated asphalt driveway. For an example, if you are driving a car on your asphalt coated driveway and the car is not moving, you should totally avoid turning on your power steering. Doing so is important because it can loosen the surface stones and create scruffs on the asphalt. In a matter of seconds, your asphalt driveway would have turned into a mess. If you want to know why this happens, do not worry, we have an answer. stressing over on finding a way to rectify it. Every newly coated asphalt driveway is supposed to be kept a watch upon. Not doing so might prove unlikeable for your driveway. The most sensitive area, however, in a newly coated asphalt driveway, are the edges. 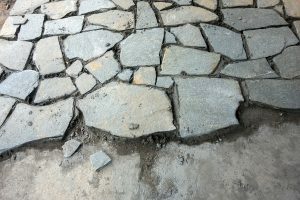 The vulnerable edges of a new driveway are prone to accidents. Also, your asphalt will often require backfilling to prevent the edge from falling away. The edges are responsible to keep the whole asphalt stick together. Therefore, it needs some extra attention than the rest of the driveway. Keep certain things in mind while on the driveway. Do not drive along or off the edges, as this could easily result in breaking the edge off. If the edge is lucky enough to not fall off entirely, the chances of at least some serious cracking is high. with. Your driveway would not only be protected from accidents but will also retain its beauty and strength for years to come. Natural stone can bring out the elegance in one’s home no matter how traditional or modern the setup of that home is. It adds a touch of class and sophistication anywhere you plan of installing one. Once used, you will be mesmerised with the end result. Whether you plan of installing it to beautify your facade or to make your flooring sturdier, it will surely bring out a standout attribute that everyone else having the chance to glance on it will envy. You do not need to have your entire home installed with natural stone improvements. There are different ways you can use natural stone installation and still bring out the beauty in your home. Natural stone can be very beautiful when you install it in your backyard space. It will be a good idea to have it on your fire pit, patio, barbecue area or your poolside. It can also be used as flooring for a deck, an entire patio or just your backyard walkway. In case you are on a tight budget and you simply do not want to miss out on the beauty that natural stone can bring out of your backyard space, you can stick to your budget. Install natural stone to add accent to your pool, fire pit and patio. Homeowners always want their homes to have that curb appeal. Nothing beats a natural stone walkway when upgrading your home. They are cheap to install and create that first impression you want. They are made out of different patterns, colours and materials that are undeniably important in achieving the look that you want for your walkway. With the help of a contractor in flagstone installation, you will be able to achieve that. The facade is that exterior part of your home that faces the street. It is your home’s frontage and will definitely be one of the spots your neighbours and other bystanders will see. Installing stone veneer on this part of your home will upgrade its look. It will be the focal point of your home’s exterior. Stone veneer can be combined with natural stone accents. When you have made this combination, it will create a beautiful impression that lasts a long way. In order to support the stone you have installed on the facade of your home, why not extend the project by installing stone walls around your home’s foundation as well. Combining wood and stone is very natural and pleasing to look at. Beyond the aesthetics, however, using stone in combination with wood will provide protection to the foundation. It can help keep moisture out thus protecting your home no matter what the weather is outside. If you think natural stone should only be installed outside your home since it is the first thing that visitors and other people see, think again. You can extend natural stone installation indoors. Take note though that there are certain key areas where the installation can be very beautiful like your kitchen, a large dining hall, on a fireplace or in your family room if you have one. This indoor installation will add a touch of class into these areas and will also add functionality to the space. The natural stone installation can protect your walls from fire if you have it installed on your fireplace. These are but just few of the projects that you can think of when beautifying your home with natural stone installation. In order to achieve the look that you want, consult with a contractor that specializes in flagstone in Richmond Hill.